My husband and I are members of a year-round CSA (community-supported agriculture, with shares for members). In Vermont. That might leave you scratching your head, wondering what the heck we’re getting from a farm in Vermont in the middle of winter, but it’s a pretty sweet deal. The farmers store a lot of root vegetables and winter squash, plus they put up lots of goodies in the summer for the winter share. Just last week we got homemade pesto and frozen tomatoes—a little taste of summer on a cold winter day! Even though we do our best to eat locally, we do supplement what we eat—particularly in winter—with whatever’s in season across the country. That means that this month, we’re eating loads of citrus—we can’t get enough grapefruit, clementines and oranges. My body just seems to crave all that vitamin C in the wintertime. And it doesn’t seem that a week can go by without having sweet potatoes or kale at least once. Sweet potatoes store well, so you might be lucky enough to find them at winter farmers’ markets near you. And kale thrives in cooler weather, so depending on where you live, you might be able to get it fresh and locally grown as well! Here are some of my favorite recipes for winter’s best fruits and vegetables. Try grapefruit in Spiced Turkey with Avocado-Grapefruit Relish: The spice crust for the turkey cutlets is based upon a Berber blend from North Africa. The honeyed grapefruit relish provides a lively contrast to the richly spiced turkey. Plus it’s ready in 35 minutes, which is perfect for a busy weeknight. 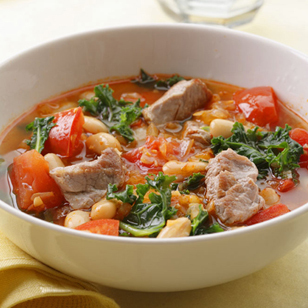 Try kale in Pork, White Bean & Kale Soup: Kale is matched up here with white beans and chunks of lean pork tenderloin to create a soup that’s satisfying and quick to make. Smoked paprika gives the soup a Spanish flair so some warm bread and sliced Manchego cheese would go well on the side. Is kale not your favorite dark leafy green? Get more recipes for chard, spinach, collards and more. Try oranges in Citrus Ginger Cake with Spiced Orange Compote: This festive olive-oil cake can be made with orange juice or Meyer lemon juice and gets an extra hit of citrus from the spiced orange compote that accompanies it. The cake tastes even better if made a day in advance, as the flavors get a chance to intensify. Try sweet potatoes in Chile-Garlic Roasted Sweet Potatoes: Give ordinary roasted sweet potatoes a big flavor boost with this quick, Asian-inspired seasoning mix.